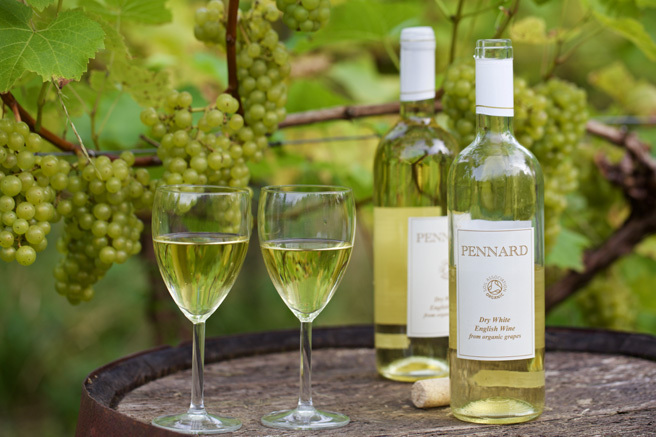 We invite you to explore our range of organic English wines (grape), fruit wines, mead, liqueurs and cider. Completely free of chemical residues, these quality products are grown and created in harmony with wildlife and the environment, deep in the Somerset countryside. Avalon Vineyard is situated on the site of a historic vineyard near Glastonbury and was started from scratch by myself, Hugh Tripp, and my wife, Hilary. Starting on just half an acre in 1981, our first wines won awards in national competitions. Encouraged, we bought more land to expand plantings and build our own winery. 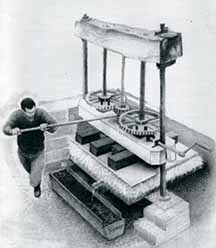 From the start we were committed to organic principles. This was facilitated by our choice of resistant ‘hybrid’ varieties of vine that do not need to be sprayed with fungicide (which is something that happens even in many organic vineyards). I was already a keen cider-maker, so we established a cider orchard as well and inter-planted with soft fruit for the sake of diversity. This diversification has been vital to our success. We now make an extensive range of fruit wines, mead, liqueurs and cider. These complement our Dry White English Wine and a limited edition of Sparkling Wine, whilst the ‘scrumpy’ cider brings in a steady stream of customers to our farm shop. We have been enormously helped in all this work by a steady stream of volunteers, known as WWOOFers (Worldwide Opportunities on Organic Farms), from all over the world, of all ages and from all walks of life. The aim of organic farming is to work the land and grow produce as naturally as possible. The stability of natural ecosystems depends upon the great diversity of plants and animals and their interactions, so that for example, predators keep potential pests in check. The natural fertility of the soil is regenerated by the slow release of plant nutrients from manure and other organic matter. At Avalon Vineyard we grow all our fruit organically, without sprays or man-made fertilisers. This non-intensive approach encourages biodiversity and respects wildlife. We control weeds by mulching, hand-weeding and keeping a ground-cover of grass, which also prevents erosion. We use compost and naturally occurring minerals to maintain fertility. We respect the presence of wild animals and plants, so we do not use any herbicides or pesticides which might leave toxic residues, nor do we want any such residues in our products. All our grass cuttings, wood ash (from burning the prunings) and compost (including the straw waste from the cider-press) are returned to the soil. The wines are made very naturally, in equilibrium with the atmosphere, which imbues them with a natural stability and complexity of taste. All aspects of our fruit growing and the making of our wine and cider are inspected and approved by the Soil Association, which is the original and main regulatory body for organic production in the UK. All our products carry the Soil Association Organic Symbol trademark which guarantees their organic status. 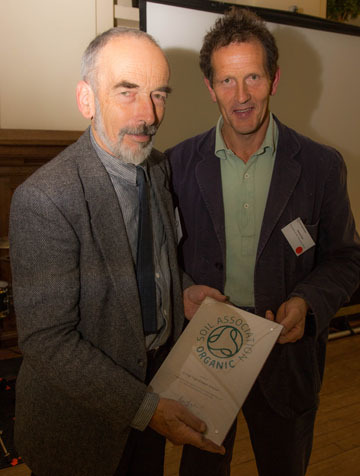 Recently I was awarded a plaque by the Soil Association, presented by Monty Don, its President, for being an ‘Organic Pioneer’ – in recognition of my holding an organic licence for over 25 years. To keep up our environmental credentials, much of our production is now powered by solar panels installed in 2011. Our farm shop is open Tuesday to Sunday from 10am – 6pm (on Sundays 12 noon – 6pm) closed Mondays. You are welcome to visit and to have a free taste all of our products – wines, fruit wines, mead, liqueurs and cider. They are very special, distinctive and delicious. Our ‘scrumpy’ cider is in barrels and can be blended to suit your taste. Card payment, cheques and cash accepted. Guided tours are available (for a minimum of 10 people) if booked in advance – there is a charge per head for this. Otherwise you can do a self-guided tour for free with our AvalonVineyard Walk leaflet – please ask in the shop for this. Hugh Tripp receiving the Organic Pioneer award.